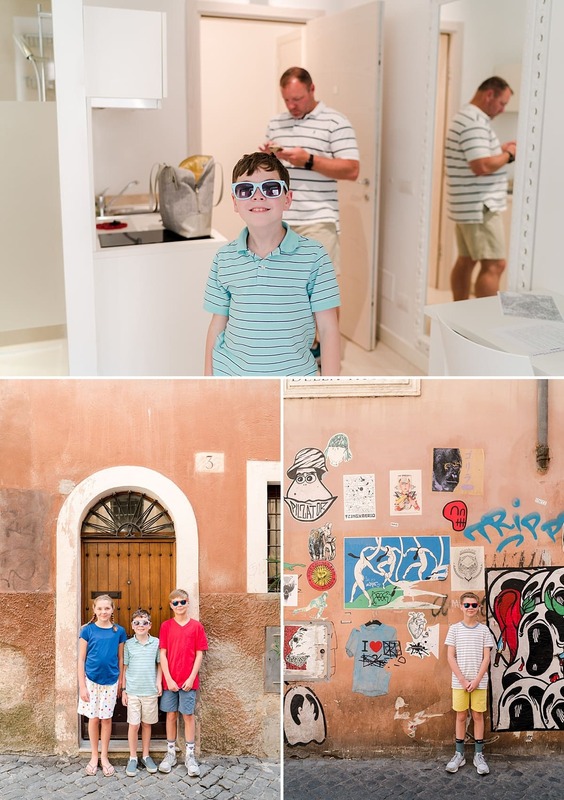 Traveling to Rome with Kids – What to See and Day in 48 Hours – Highlights from our trip to Rome. Trastevere, Vatican, Colosseum, amazing food and LOTS of gelatos. 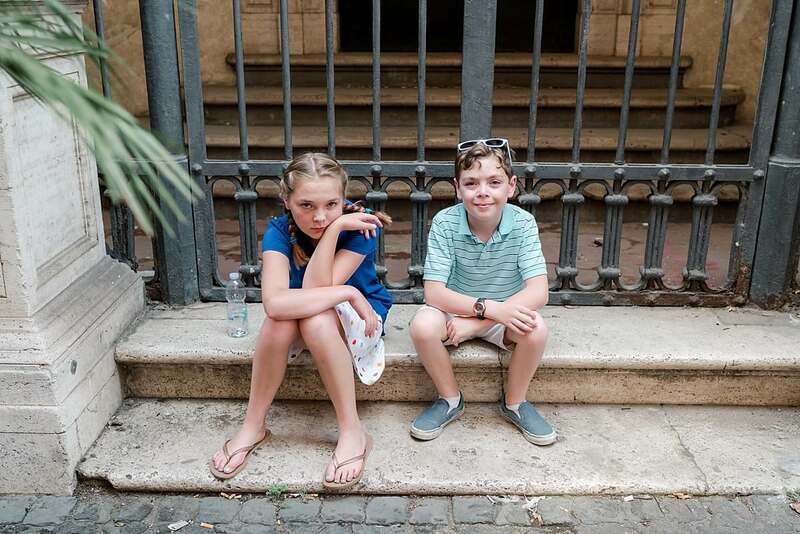 Traveling to Rome with kids is not only do-able, it is delightful. Let me back up a minute. Moving to Europe involves a lot of moving pieces. We decided to take an extended vacation in between flying to Stuttgart and when Wes had to report to his new station. We dropped our bags at the hotel we would be moving into when we got back to Stuttgart, spent one night, and then got on a plane to Rome. We were exhausted. I don’t even know if exhausted really does how we were feeling justice. We had just packed out, said goodbye to our friends and family, and flown overnight to Germany. This short trip was to fight jet lag before we boarded for our Mediterranean cruise. We had little to no agenda other than to get some rest and see a little bit of the city. 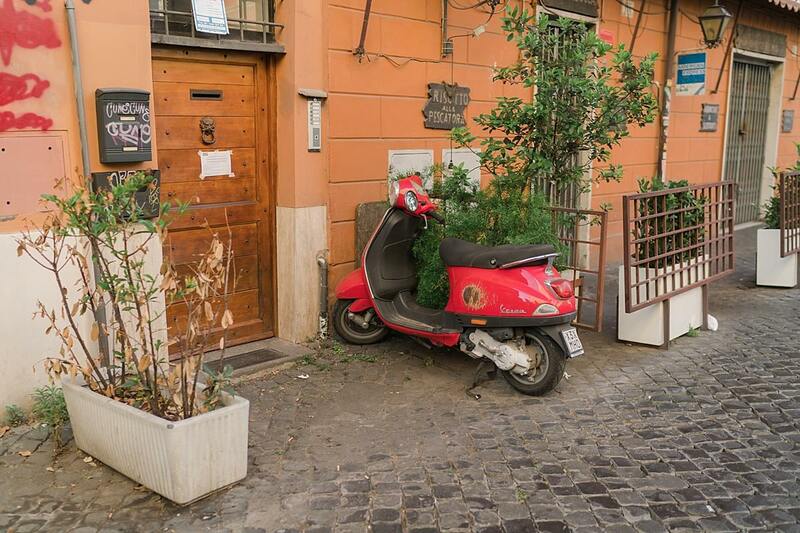 We stayed in a Homeaway property in the Trastevere area of Rome. It was in a perfect location and the apartment spoiled us for the rest of our travels. It had a perfect layout, lots of space, was incredibly clean and the owners were gracious and helpful. (Can’t recommend enough.) We were able to walk most places and there is a taxi station nearby if you needed one. We spent the first afternoon wandering around, eating gelato, and just taking it all in. 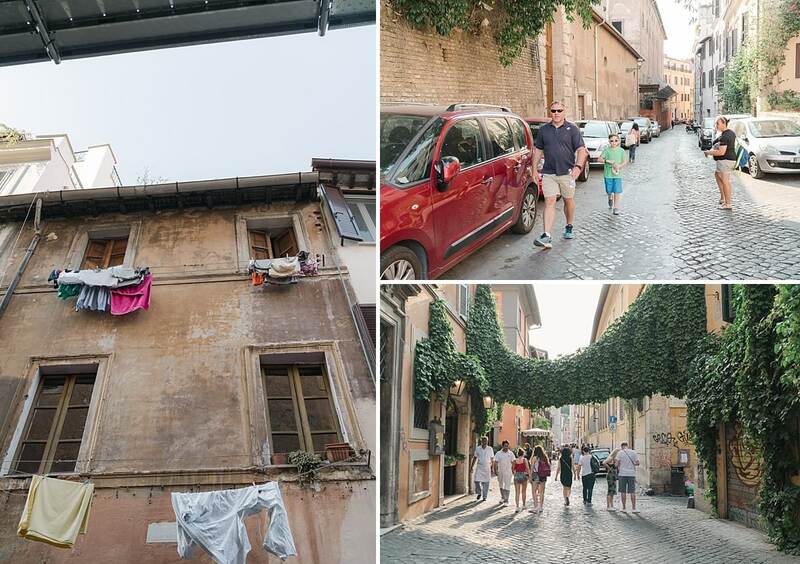 I’ve been to Rome a few times, but this was the first for the rest of my family. We ate cacio de pepe (one of the most delicious things I’ve ever eaten) at a little restaurant across the street from our apartment and the kids had the first of MANY gelatos. The rule was that you could not order the same flavor for the whole trip. Some of us (me) did better than others (William). We had no idea what time it was and we were drained, so we would go out for a few hours, come back to recharge, and then head back out. It’s a nice way to travel. As of this writing, we have been on far more trips. 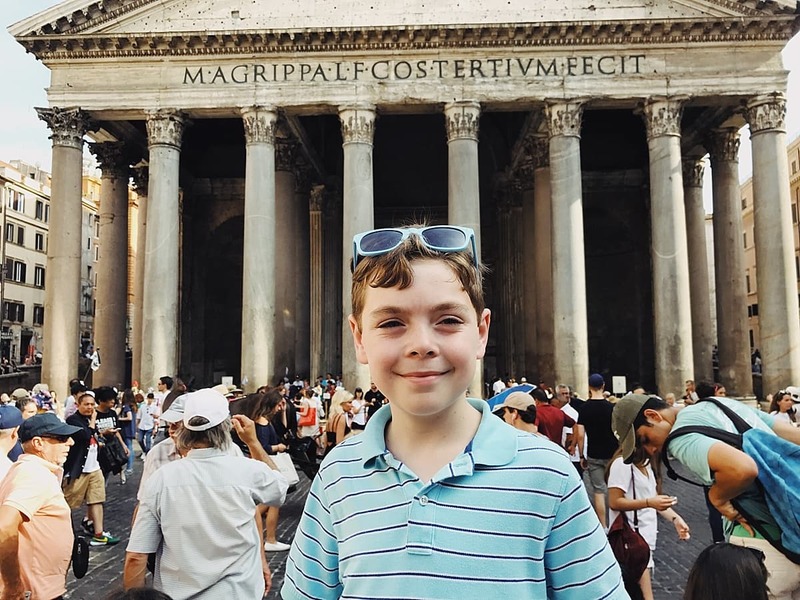 I find that my kids are far more willing to do the kind of boring sightseeing if we factor in a lot of time for wandering and exploring with no agenda. We have found true gems and learned far more about a place than just by seeing the touristy sights. Those are important too, but we don’t try to see everything in a single place just to check it off a list. And we also relent and do some of the kid stuff to balance it out. It needs to be fun for everyone. 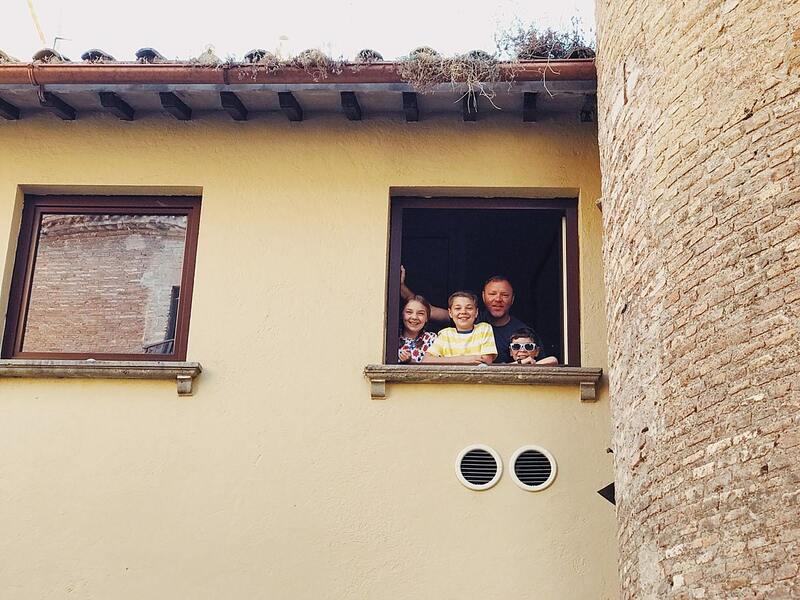 The one thing that I did book before we arrived was a Dark Rome Family Tour of the Colosseum. Paolo our tour guide was great. He made it interesting and entertaining enough for the kids and didn’t dumb it down for the adults. It was very hot, and the Colosseum has built-in air conditioning (which we learned from Paolo) and it was a nice reprieve from the heat. 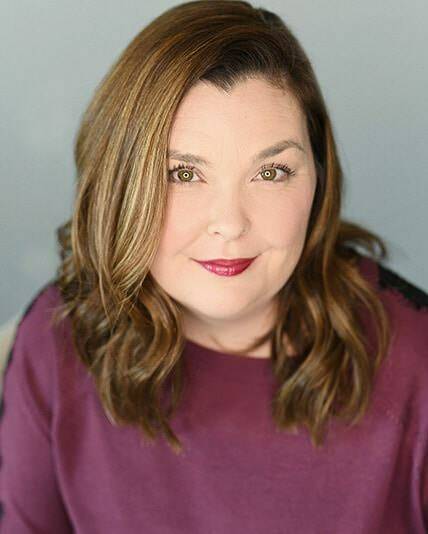 Tip – Booking a tour is the way to go. One, you get to skip the line at many attractions. Two, we met some other nice families that gave us some great tips. Three, we learned far more than we would have on our own. 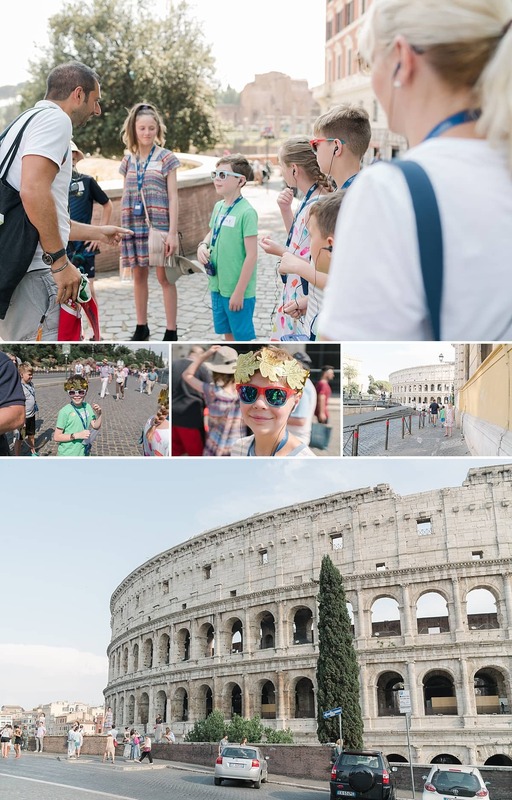 The tour included the Colosseum and the Roman Forum. 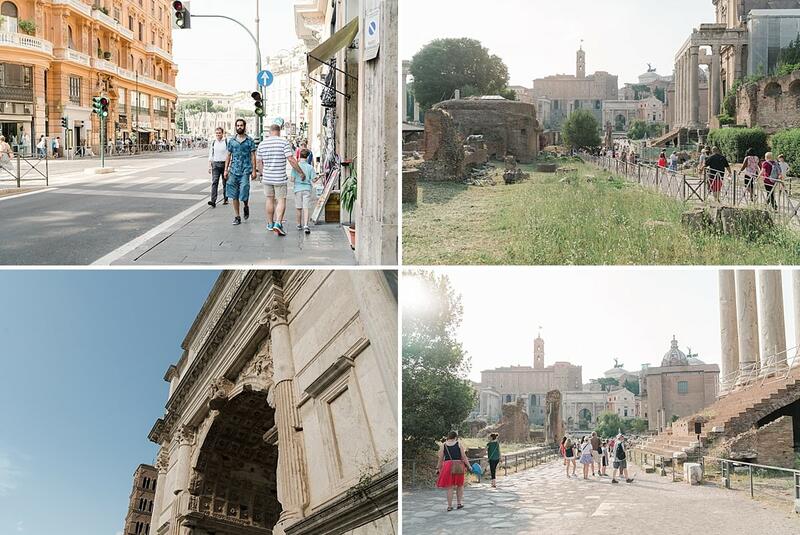 We left the Colosseum and walked across the street. We booked a tour for around 3 and it was a good time, it was far less crowded. I am never going to get tired of seeing olives growing on trees. It’s going to be a theme in the next few travel posts. Near the apartment, there was a river walk with little shops and restaurants set up along the water. It is called Lungo il Tever. 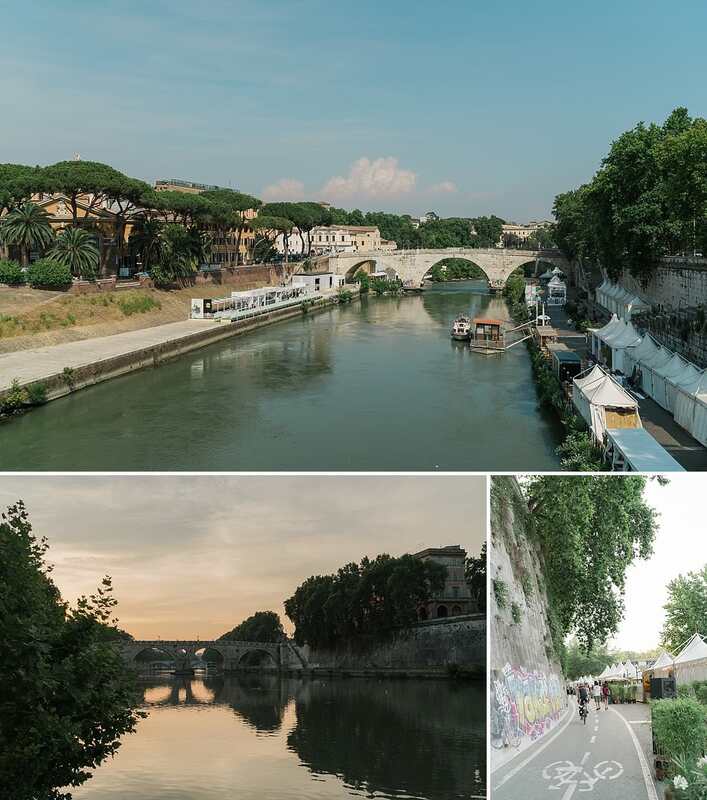 It is only up in the summer and you can enjoy a drink or a meal along the Tiber River. We left the kids in the apartment (they are old enough to stay alone for a few hours and we were in a very secure building) and walked up and down. We had a drink, some antipasto, and watched the sunset. This is a perk of traveling with older kids, we can leave for a few hours in the evening if they don’t want to go out. We get a break and they can glue themselves to a device – everyone is happy. 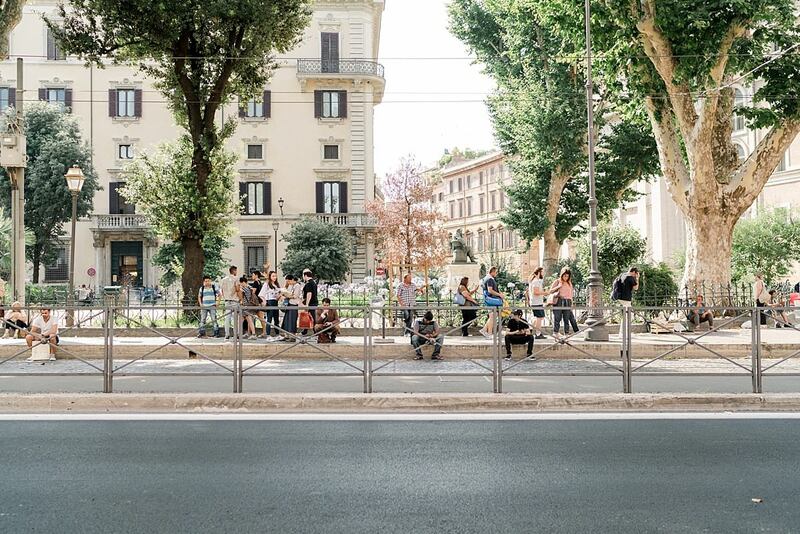 The next day, we went to Villa Borghese. We had an incredible lunch at an outdoor cafe called Pic Nic. The restaurant is in the middle of the park. 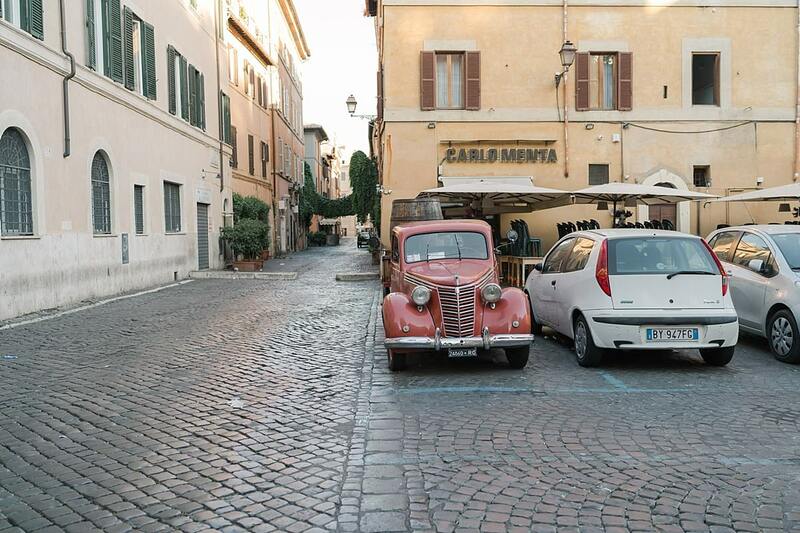 We rented a golf cart (you can also rent bikes, Segways, and even vintage Fiats) and drove around for a few hours. This was the kids favorite afternoon. They loved being outside and being able to run a little. And the golf cart was a novelty they really liked. There are street musicians, games, and playgrounds, and a museum. We skipped the museum and opted for more gelato at a different cafe in the park. We also visited (more like drive-bys than actual “visits”) the Trevi Fountain, The Pantheon, and The Spanish Steps. One of my favorite things to do when we are traveling is to get up really early (this is the only time I enjoy getting up early) and go on a solo photo walk. I grab my camera and just wander and take pictures. This is a great way to shoot some of the more touristy or popular things that are hard to get to when there are so many people at different times of the day. This picture is one of my Top 10 favorite pictures I’ve ever taken. 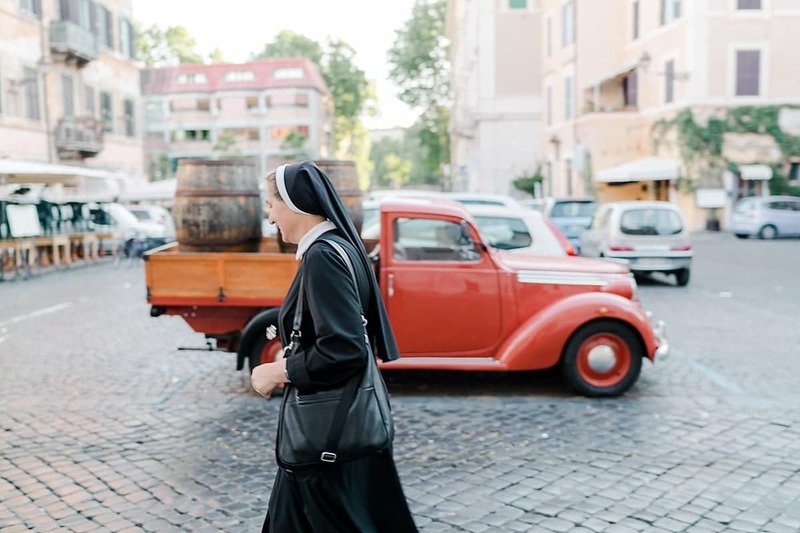 It was around 6:30-7am on a Sunday and I happened to catch a nun walking to Mass in front of a vintage truck. And I had a camera in my hand. That’s never going to happen again. (It’s a smidge blurry and I don’t even care, it actually makes me like it even more.) She smiled at me as she walked by and said, “Dio la benedica”. May God bless you. It was such a perfect morning. As I walked back to the house, I stopped at a cafe and had a coffee by myself and watched the city wake up. Wes likes to explore a city by running it. He is naturally an early riser and he usually will go for a long run at least one of the days. 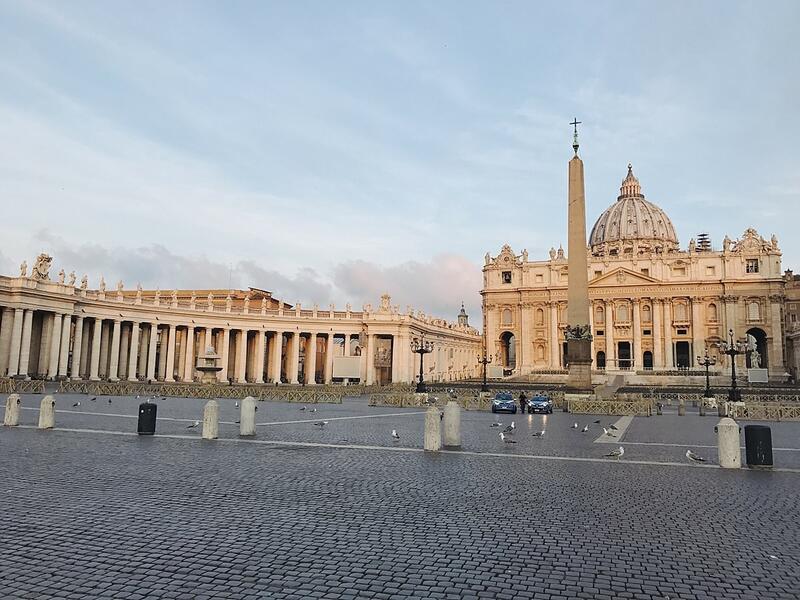 On this particular morning, he had the Vatican to himself. I’ve been to the Papal Audience, and I can assure you, that is not what my view looked like. Can you tell who was over walking? See, they aren’t always happy and willing participants. 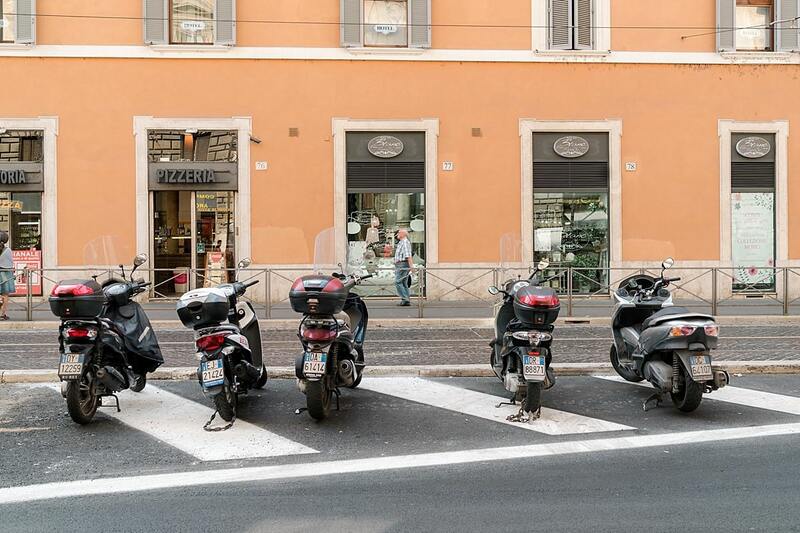 Even though it was a very short trip, we thoroughly enjoyed our time in Rome. 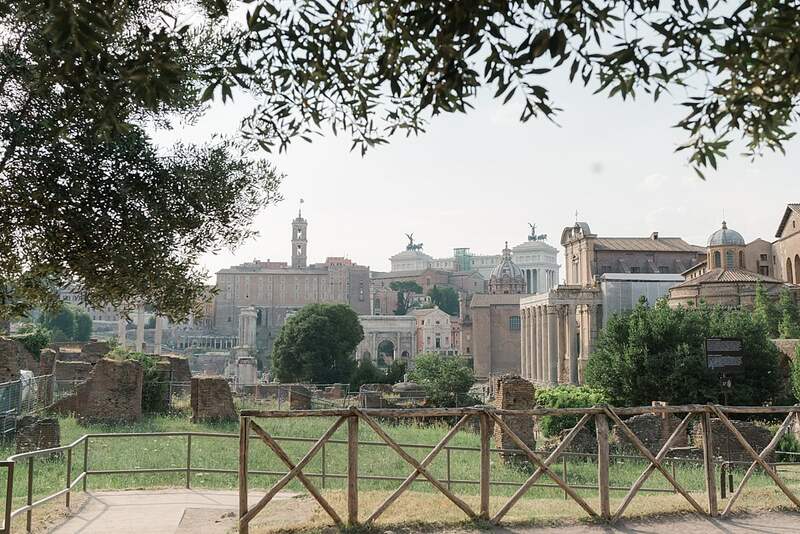 Traveling to Rome with kids is really easy, and I think that it one of the more accessible cities in Italy. Amalfi was gorgeous, but not easy to walk around. 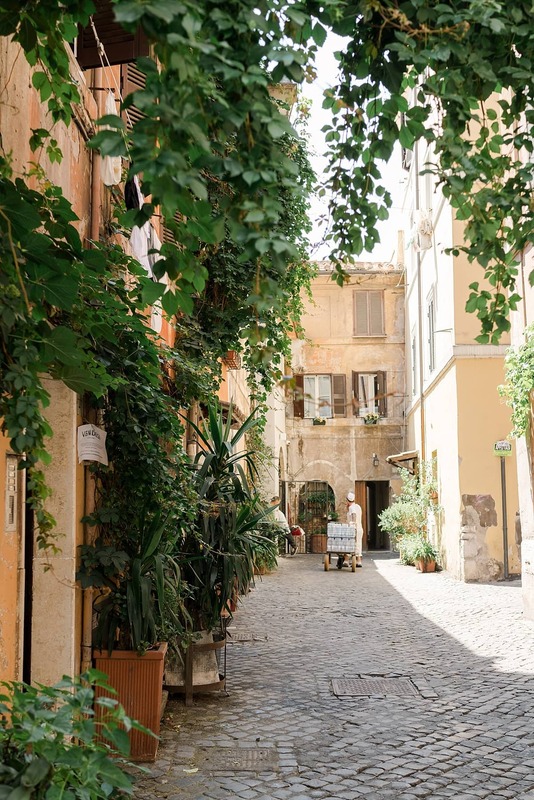 There is so much to do and see in Rome. 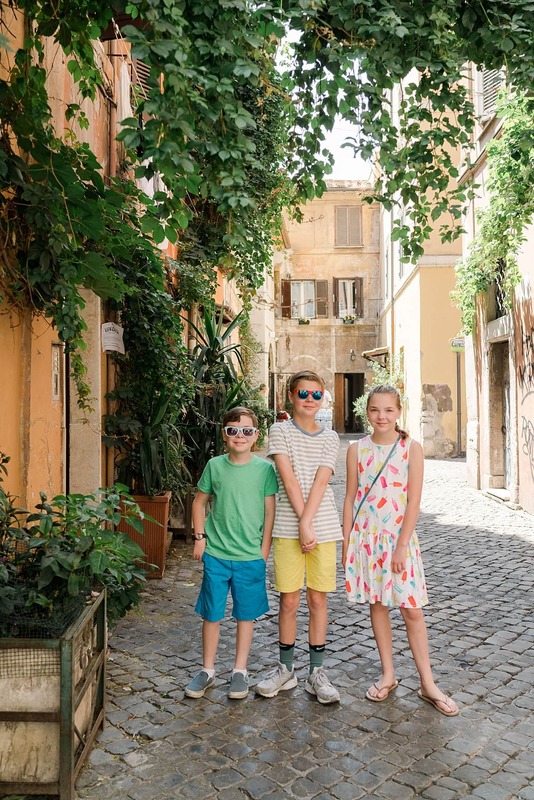 What are your favorite things to do when traveling to Rome with kids? Let us know in the comments below! We really enjoyed using the Mission Rome book by Catherine Aragon. The gist of the book is that the kids are spies on a scavenger hunt in the city. Our 11 year old was so hooked that we bought additional books for Barcelona, Paris, DC, and NYC. The adults even enjoyed the facts learned about the cities. I love those books! I bought a few, I need to dig them out of the bookcase for our upcoming Paris trip. 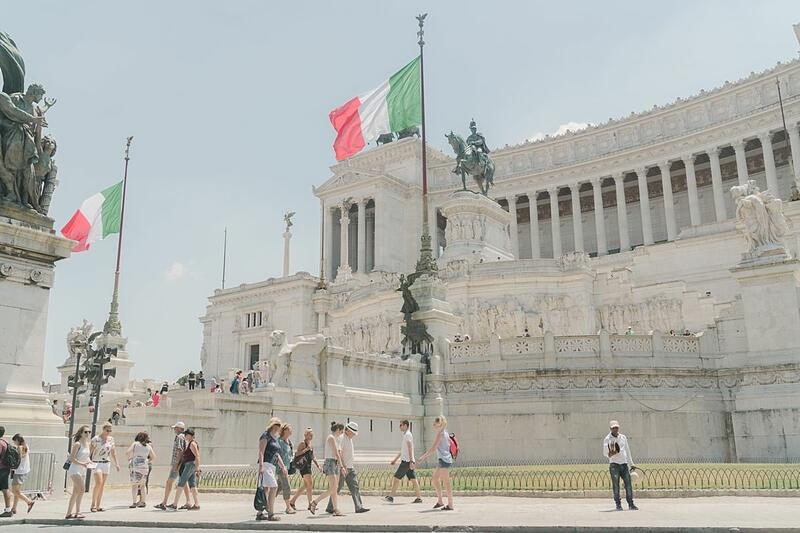 I cannot wait to take my family to Rome. To say “it is such a beautiful city with so much history” is so cliché, but so true. I will definitely take your advice on the Coliseum tour. Going with kids will definitely be a greater challenge this time around. It’s a great city for kids. Easy to get around, walkable, and lots to do! You should go! It is such an amazing city.